Superman may have had an awesome collection of superpowers, but he had a weakness: Kryptonite. Hydraulic motors are designed to transmit extreme amounts of torque and are made to survive some of the roughest environments there are. Final drives are tough. So what's the Kryptonite for final drive motors? Here's the answer: contamination. 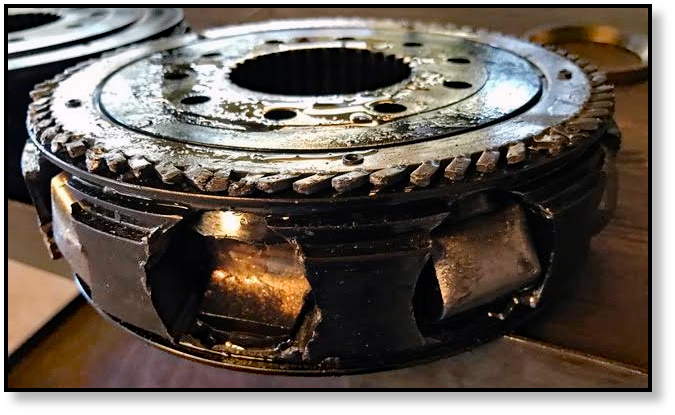 Contamination starts by reducing the efficiency of your motor, then it begins to damage components. As the contamination moves through your final drive, it starts creating new contamination. Tiny pieces of metal break off the gear splines. Flakes of metal fall off the bearings. Scratches keep getting worse, and wear occurs on key components. And then your final drive motor finally can’t take it anymore and you have a catastrophic failure. Tiny slivers of metal can bring down a powerful hydraulic motor -- it may seem hard to believe, but it is a fact. Contamination is the Kryptonite of hydraulic motors (and even more so for Geroler motors). Don’t expose your final drive motors to contamination. That may be hard, but there are some steps you can take to do this. Only open final drive motors in a clean environment. Clean the final drives before you open them. Always use clean fluids when you perform any cleanse or other maintenance work. Don’t let hydraulic hoses or plugs fall into the dirt. Spider-Man can do awesome things with his web, which usually seems strong enough for whatever load he puts on it -- himself, himself and Mary Jane, himself and his great power and great responsibility... the list goes on! Although you might not use a web like Spider-Man, when it comes time to pull or install a final drive motor you will likely use some kind of sling or chain. It might not be webbed, and it might not shoot from your wrist, but it does need to support a pretty heavy load. Before you move a final drive to and from your machine, inspect the chain that will be holding the motor. Final drives are heavy, and the bigger they are, the harder they will be to lift and handle. If the chain that is holding your final drive up isn’t strong enough, it could break. 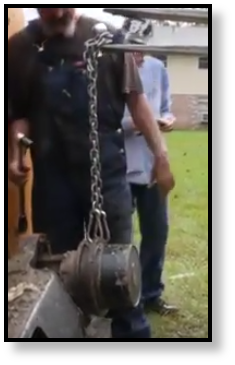 The final drive motor could even fall on you, at which point, even if you have on steel toe boots, there will still be some severe pain involved. Before lifting up a final drive using a sling, make sure there are no cuts, tears, or signs of excessive wear. If it is a chain, make sure there are no damaged links and that. Check that it is secured to whatever lifting device you are using. And don’t get underneath the final drive while its being moved! It’s not Spidey’s web, after all. If there is one thing we know about the Incredible Hulk (aka, Bruce Banner), it’s that we don’t want to make him angry. There's just no reasoning with him when he's angry! And the results of the Hulk's anger can be disastrous to say the least. Final drives are awesome when they work. They can keep your excavator moving, carry your CTL along even with a massive load in its bucket, and keep those skid steer wheels rolling. But you can make those hydraulic motors angry by not maintaining them. And you won’t like them when they are angry! When final drive motors get angry, that usually start by making strange noises, heating up, and providing less power. The angrier they get, the slower they move until soon they just won’t turn at all. And then your machines won’t move, either. They don't care about deadlines or about how you're going to get the machine on the trailer just to take it in for repair. Like the Hulk, they are most unreasonable when they get angry. Keep them happy with preventative maintenance! 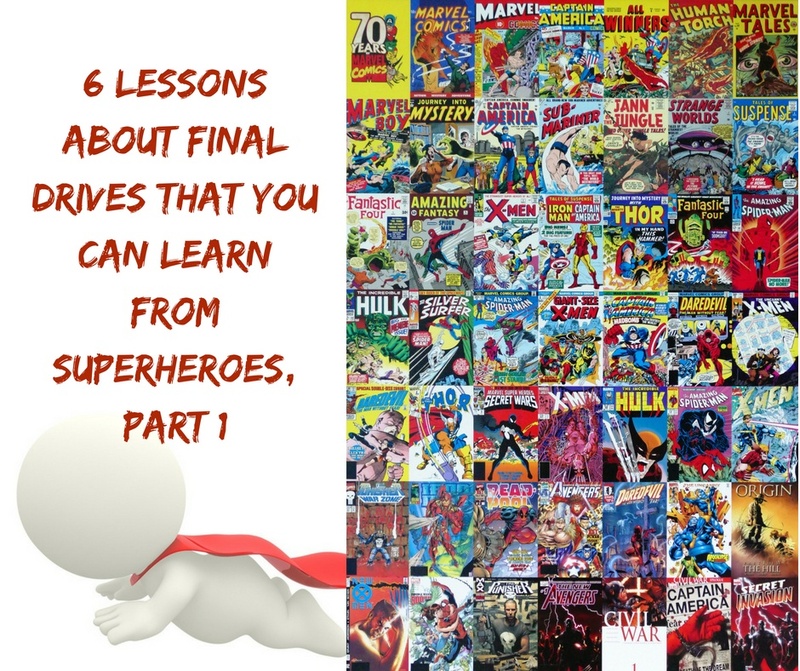 Contamination issues, safety issues with moving final drives, and the importance of preventative maintenance are good lessons to learn from Superman, Spider-Man, and The Hulk, respectively. Do you have any good lessons about final drives that you’ve learned from superheroes (or maybe super villains)? If you do, feel free to share them in the comments. And keep an eye out for part 2 of this series!